The Media Hub Of Austin’s Awakening Community! Our media company specializes in local spiritual, holistic and metaphysical news, resources, and events. Serving the Central Texas area since 2010. Join our free newsletter to stay in the know about local resources and events! Here at TAA, our goal is to serve and help bring our unique community together more easily. Created by members of our community for our community, we know what our fans seek. We only share information about local body/mind/spirit/holistic (BMSH) events, authors, classes and practitioners in Central Texas. If you’re a fan of BMSH, then you will definitely enjoy The Austin Alchemist’s specialized news! From San Antonio to Waco, if it’s BMSH, involves a tangible destination and it’s local to Central Texas, we cover it! 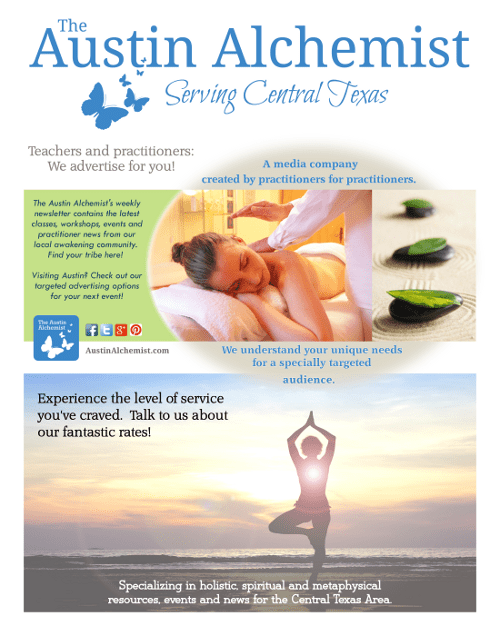 If you are a practitioner looking for a place to advertise your local BMSH services, then The Austin Alchemist Directory is a very good place to do it! We treat every directory page as if it were its own mini-website, optimizing each listing for SEO. And we offer competitive advertising for a specially targeted community audience! You can check out our Success’s Page and our Advertise Page to find out lots more! I have served and helped network our growing community for more than 15 years, as an educational host, teacher and numerologist, via The Seeker’s Round Table and via the Austin Metaphysical Life Fair. Serving our spiritual family through The Austin Alchemist is a natural and welcome fit. As Editor in Chief and media director, I am pleased to be at your service! I handle all the editing, content direction, graphic work and social media strategy for The Austin Alchemist and its parent company Spiritual Life Productions. The poster you see below is just some of my handy work. Every post on our website receives my personal attention and every ad placed is handled and coded by a real person, to the very detail. The Austin Alchemist is born from the idea that between our professional members providing their own advertising copy, and our work in handling social media ad placement, we can together reduce costs and serve our community better with advertising we all can feel good about. It is this team energy approach, and dedication to serving our local community, that makes our our efforts so powerful and our prices so competitive. Let’s face it, whatever your work, advertising is important. People can’t find you if you don’t put up a sign. But effective advertising for our unique community is simply not the same as it may be for other fields. We know how our people like to get their information (and how they don’t)! And Body/Mind/Spirit/Holistic – by its very nature – is unique in its drive towards a community of service, and its dislike for traditional advertising. But trust me, there is a way to both focus on your amazing service to others AND find your tribe! Let me help you to do what you do best – serve our community! While the heart of TAA is built upon the idea of a team effort between us to serve our community better, sometimes you need a little more than just a little help getting the word out about your offerings. Maybe you need copy writing help, social media advice, or you need graphic help that you don’t have the tools and time for. When that’s the case, and you’re unsure where to begin, just contact me and let’s see how I can help you. The Austin Alchemist is a division of Spiritual Life Productions.